Washington, DC—Thursday, November 22, 2018—Central Union Mission is preparing to serve 500-600 Thanksgiving meals at its homeless shelter, as well as providing more than 2,000 meals worth of Thanksgiving groceries to low-income families in Washington, DC. With the help of over 100 volunteers, Chef Horatio Davis of Capital Hill Crabcakes will be in the kitchen cooking 50-60 turkeys—including fried and smoked turkeys, which are brining in the walk-in refrigerators now. Compassionate friends will be setting tables, hosting and waiting tables for our two Thanksgiving seatings at 12:00 pm and 5:00 pm, as well as making sandwiches for those on the street and preparing the Mission for Christmas. In addition to turkey with all the traditional trimmings, neighbors experiencing homelessness will be served and hosted by community volunteers. Thanksgiving food food is donated by private friends, churches, offices and other groups, or it is purchased from the Capital Area Food Bank with monetary donations. According to Mission Executive Director Joe Mettimano, “This is one of the most important holidays of the year for Central Union Mission. 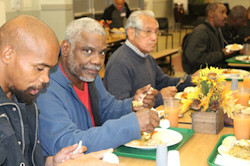 Hospitality is what we do best, and there’s a reason for that: We believe ‘hope begins with a meal.’ Some pumpkin pie might be all it takes to encourage a homeless person to want to renovate his life, and the Mission will be there with the programs to help.” We are grateful for all the generous gifts that make this event possible. Media are invited to attend. Please contact Deborah Chambers at 202-534-9965 or dchambers@missiondc.org to coordinate interviews with Mission, guests, volunteers and staff. Central Union Mission is a faith-based 501(c)(3) nonprofit organization and the oldest private social service agency in Washington, DC. In addition to its emergency shelter, which provides over 62,000 bed-nights each year, the Mission operates a holistic, Christ-centered transformation and workforce development program for men, provides benefits for veterans, helps people overcome addictions, operates a food and clothing distribution center which provides food for over 4000 people each month, runs a camp for underprivileged children, and offers a ministry to families and senior citizens.GuideStar awarded Central Union Mission a Gold Seal for our financial transparency and GreatNonProfits has given Central Union Mission a Top-Rated award.